Good job and parabéns, but let's not act as if it's an incredible surprise that Brazil kept it a respectable score. At home they've always (OK, 'always', these past three seasons) been pretty competitive and if my doubts have always been about their away performances, they already did a great job against Racing 92 in the Tbilisi Summer Cup as well. It's a shame they haven't got a 'real' test match where to go for the victory and imposing their gameplan this month after Belgian plans fell through. Crowd was just over 34,000. Well, I’d say Brazil can hold their head high. That was the biggest challenge they’ve ever had to face and they did well to compete against a lot of seasoned Super Rugby players. A lot of positives to take away from this match. Awesome job Brazil! Onward and upward. I'd call it a surprise, I expected them to lose by 70ish. Good result for them. I am also surprised by the scoreline. I didn’t quite expect 70 but thought it’d at least get to 50. Official attendance: 34.451. Brilliant, in a rainy day. I worked in the field and it was a magnificent day. Saw friends crying of joy. And the Tupis resisted playing with 14 after an early sin bin. Last edited by victorsra on Sun, 11 Nov 2018, 03:52, edited 2 times in total. Saw you on the Portuguese stream at halftime, good job. My girlfriend speaks Portuguese and translated some things for me. Vai Brasil. Question on that attendance, how many do you figure are Brazilian rugby fans vs people who've never seen a game before? And how many do you think travelled to Brazil for the game from somewhere else? The guy commentating is Virgilio, a great friend that presents our Mesa Oval podcast. I was reporting on the field and did that appearence on halftime. Man, 75% at least were rugby people I'd say. People from all over Brazil travelled to watch it... maybe about 30%? It is just a guess. Yes, I agree. Away matches were problem, but the victories over Argentina XV in Buenos Aires and Georgia XV in Tbilsi in 2018 are the positive news. Last edited by victorsra on Sun, 11 Nov 2018, 04:20, edited 1 time in total. I thought Brazil would concede at least 60 points. The weather did play a part but to be 100% fair Brazil really battled hard. It would have been great to have crossed for a try but still they should be happy with themselves. The Maori obviously aren't the All Blacks but they can beat any T1 nation they play. What I think this game shows is that the gap between the rugby nations isn't actually as large as we think it is. Defence has always been the biggest issue for T2/T3 nations since the game went professional but that has largely improved across the world with better coaching and more professional training programs in place, and the results are starting to show. Hopefully Chile perform in a similar way next week. 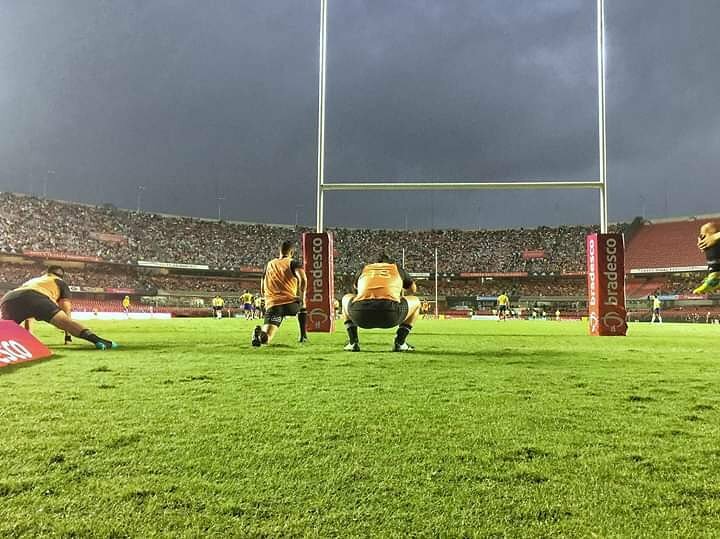 But overall, a great day for the game in Brazil, their next goal needs to be Rugby World Cup qualification in 2023. I heard from a Chilean friend they are pressed now to put a good attendances and have a good result, which is a very good effect of a regional rivalry. As I always say, Chile is not dying as some people think. They just had different priorities recently. They have extra motivation then for next week. They don't want to be looked at as weak which is good. The more competitive they get they better for the Americas region. Ideally we want to get to the stage where the ARC is competitive enough where anyone can win it. Of course. We need Chile strong, Canada strong, Brazil strong. victorsra wrote: I heard from a Chilean friend they are pressed now to put a good attendances and have a good result, which is a very good effect of a regional rivalry. As I always say, Chile is not dying as some people think. They just had different priorities recently. victorsra wrote: Official attendance: 34.451. Brilliant, in a rainy day. In a city where on the same day the main soccer derby is on. In a city where on the same day the Formula 1 has a race. That's really, really, really impressive. Congrats! Also congrats on the scoreline. Well done Brazil! Samoa prop James Johnston (brother of Census) impressed with the Brazilian scrum. How does the Brazil scum compare to the others in the ARC? thatrugbyguy wrote: Crowd was just over 34,000. Well, I’d say Brazil can hold their head high. That was the biggest challenge they’ve ever had to face and they did well to compete against a lot of seasoned Super Rugby players. A lot of positives to take away from this match. I agree that Brazil can hold their head high. I'm not sure that the MAB side was that good though. Not that many well-known players there. Brilliant idea though for them to be touring and playing these countries, I really hope that they continue with this and expand it to other rugby areas. Any chance that other top countries could send their development sides touring like this? They looked good when they put up 60 points in Chicago.